A round bag filled with gas simply called balloons can bring so much delight in any party or fun gatherings. It’s not under wraps that balloons are loved by all, be it foiled, confetti, or orb, all types are equally welcomed. 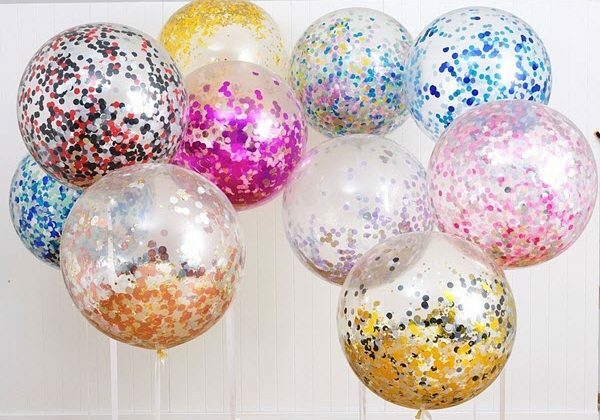 But when it comes to confetti balloons you will get an easy balloon decoration ideas and things can be the bit tricky to get perfectly done, at least those who are putting their hands around for the first time. This content will help you through to get all the info u need for getting that perfect confetti balloons. A small reminder, while filling up a confetti balloon, use mixture of helium and air, first try filling it with new wafts of air and then the remaining with helium. At first, these balloons look a bit clumsy or smoggy colored, but once they’re completely they look transparent. First with the help of your mouth, blow few puffs of air in the balloons. After that attach the balloons to a helium tank and pump up rest of it with helium gas. Inflating the balloons for once doesn’t make it float or look clear, which means it’s not yet filled with the adequate amount of helium, and thus need to be filled quite more. Don’t use hi-float as it gets the confetti all wet. Once the balloons are filled in a knot must be tied in the end of the balloon to seal the filled air and gas within. Tie up the knot tightly to secure it nicely. Now is dispersing the confetti. After following the above steps correctly and perfectly, if the confetti still hasn’t got plunged to the walls of the balloon, and is creating a clumsy pool of confetti at the bottom of the balloon, don’t worry. Everyone has been there once, and so there’s one easy fix, though it may be depending on the ambiance, humidity, and temperature of the room. You can fill up the balloon with your desired blend of colored confetti to match up with the theme of your party. Besides colorful confetti balloons, no doubt looks gripping to the eyes. It’s convenient using smaller confetti as they fit down the throat easily. But if one is going for the larger shapes and sizes then having another hand for help is suggested. One person can stretch the mouth of the balloon while another can put in the tissue paper shapes within the chamber carefully. Whatever you use try using the flat ones and not the cupped faceted ones. The cupped ones create a mess in sticking, so the flat ones are good to go. If you’re willing to use the foil stuff then just hand cut into little shapes. A static energy needs to be created by rubbing the balloon on any item like; woollen jumper, cloth, or a scarf. After this, roll the balloon across for the ultimate dispersion of confetti. Now it looks all cool. Just note that the confetti balloons will not float as long as the standard ones due to additional confetti and helium mixture.